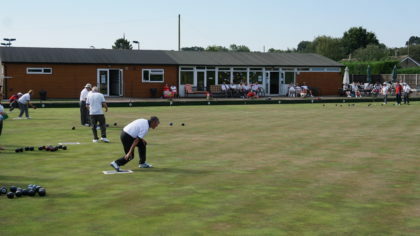 Oundle Bowling Club held its first Gala Day on Sunday 5th of August. A total of eighteen teams entered the match, eleven being visiting teams and the remainder from OBC. The President, Margaret Walker, welcomed the teams and the match got under way at 9.15 am, each team playing a total of 4 matches of 7 ends. A hot lunch was provided as well as tea and cakes in the afternoon and a raffle followed. Most visiting teams competing, were from around the County, however, it was a pleasure to welcome, once again, the team from Disability Bowls England who had previously visited us, on our Open Weekend. The day was supported by local Business Association sponsors, Just Lets, Bulley Davey Accountants, Waterland Architects and QI Marketing & Web Design, to whom we are very grateful.